PETALING JAYA: IOI Properties (S) Pte Ltd (IOIP), a wholly-owned unit of IOI Properties Bhd, is proceeding with luxury residential projects in Singapore as the property market there strengthens amid an economic recovery. The projects there have been delayed for almost a year due to the recession. The preview sale of its maiden project, Seascape Collection, on March 26 received encouraging response with S$200mil worth of sales chalked up to date. The limited units available for sale have an average selling price of S$2,700 per sq ft.
A substantial portion of the sales were from high net-worth individuals from various countries, including Malaysia, Singapore, Indonesia, India, China and the Middle East. Datuk David Tan, the executive director of IOI Properties, said the official launch of Seascape was rescheduled to May to leverage on the strong market recovery. The recent completion of Resorts World Sentosa, Singapore’s first integrated resort, which opened for business on Feb 14 is also a major boost. “The economic recovery and more positive market sentiment have been a boon for Singapore’s property market. The opening of the two integrated resorts in Marina Bay and Sentosa this year and their potential spillover effect on the other commercial and tourism activities is driving buying sentiment as investors are looking forward to good capital appreciation,” Tan told StarBiz. Singapore’s second integrated resort, Marina Bay Sands, is scheduled to open for business on April 27. Tan said waterfront homes boasting unobstructed sea views were being marketed as “the ultimate experience in lifestyle living”. IOI Properties has two high-end condominium projects in Sentosa Cove – Seascape Collection and Pinnacle Collection – all sea facing residences. Tan said the projects were the last two remaining and most strategic condominium sites at Sentosa Cove. 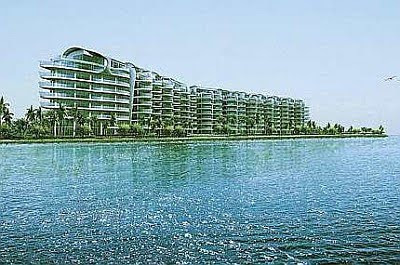 It comprises two eight-storey condominium blocks of 151 residences with net saleable area of 408,800 sq ft. The residences have prices ranging from S$2,500 to S$2,800 per sq ft, for a gross development value of S$1.1bil. IOI Properties is also in a joint venture with Ho Bee to develop the S$2.2bil Pinnacle. Located on 5.3 acres, it will have 304 units with total net saleable area of 716,000 sq ft. The site was tendered for S$1.1bil in 2008. The project is currently at piling stage and the launch is slated to be next year, depending on market conditions. Flanking the entrance of the marina leading into Sentosa Cove, Pinnacle will have seven 18-storey blocks and one 20-storey block of luxurious condominiums. The company’s third project in Singapore is Cityscape@Farrer Park. It will have 250 units with net saleable area of 297,400 sq ft and GDV of S$350mil. It is now at the building plan approval stage and scheduled for launch in August. Tan said the company was also on the lookout for other property development and investment opportunities in Singapore. Locally, he said IOI Properties preferred to leverage on its expertise as a reliable township developer with a broad range of residential and commercial properties for the mass market. The company also places priority on community relationship development in all its townships through neighbourhood residential associations, community events, a dedicated community website at myioi.com and township newsletter, Reachout. On the company’s latest development, 16 Sierra, a new 220-ha township at the entrance to Cyberjaya, Tan said the maiden launch of two phases of Sierra 8 terrace houses priced at RM468,000 had been very successful. Within the next 1 1/2 years, there will be launches of townhouses (GDV of RM170mil), terrace houses (RM115mil) and semi-detached houses (RM95mil). Other upcoming launches are in Bandar Puteri Puchong, Bandar Puchong Jaya and IOI Resort Putrajaya in the Klang Valley. Its ongoing projects in Johor – Bandar Putra Senai and Kempas Utama also have new phases for launch. The company currently has an undeveloped land bank of around 1,635ha, of which 400ha are in the Klang Valley, 880ha in Johor and 5.2ha in Singapore. For the past two financial years, it recorded sales of RM630mil a year. For this financial year ending June 30, sales from its Klang Valley and Johor projects are expected to increase by 50% to more than RM900mil. SUNWAY City Bhd plans to focus on building retail and commercial properties and luxury homes at its multi-billion-ringgit Sunway Integrated Resort City (SIRC) in Bandar Sunway, Selangor. Managing director, property investment, Ngeow Voon Yean said there is lack of retail and commercial products at SIRC to attract multinational companies (MNCs). SIRC, which started some 15 years ago, has two operating hotels, shopping malls and universities, Sunway Medical Centre, condominiums and villas, convention centres, shopoffices and a theme park. There is Menara Sunway, the only office tower in the township and occupied by Sunway Group. "We have MNCs keen to set up shop here because of the infrastructure and location. We are planning two 30-storey green office towers and will start building in the second half of this year," Ngeow said. Ngeow said the first tower, with 277,000 sq ft of net lettable area, will be built next to Sunway Resort Hotel & Spa and linked to Sunway Pyramid Mall. The second tower, with 550,000 of net lettable area, will be built next to Menara Sunway. 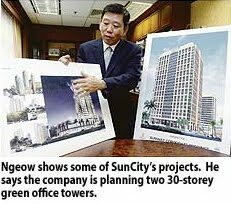 He said SunCity will spend RM400 million to build the towers, which may be leased, sold via en bloc or injected into a real estate investment trust (REIT). "We are optimistic SunCity's property investment division will continue to do well this year. We are looking forward to more excitements as we are in the process of unlocking the value of selected real estate properties for the REIT," he said in an interview with Business Times in Bandar Sunway. SunCity recently said it plans to sell its stakes in Sunway Pyramid Mall, Sunway Resort Hotel & Spa, Pyramid Tower hotel, Menara Sunway, Sunway Carnival mall, Sunway Hotel Seberang Jaya, SunCity Ipoh hypermarket and Sunway Tower to a REIT. The REIT, which may be worth around RM3 billion, is schedule to be launched later this year. Currently, SunCity's investment division owns and manages RM4.7 billion worth of assets, including Sunway Giza, Sunway University College and Monash University Sunway Campus. Ongoing construction at SIRC is Sunway-Monash U Residence, which is being built for RM170 million, for students at the two universities. According to Ngeow, SunCity's investment in SIRC will reach RM5 billion by the time it is fully developed within the next five years or so. The multi-billion-ringgit Sunway Integrated Resort City (SIRC) in Bandar Sunway started when founder Tan Sri Jeffrey Cheah Fook Ling turned to property by chance in the 1970s. Cheah was born in Pusing, a small town outside of Ipoh in Perak. He had his primary and secondary education in Batu Gajah before leaving to pursue his tertiary education at the Footscray Institute of Technology (now Victoria University) in Melbourne, Australia. Cheah started his career as an accountant in a motor assembly plant in Malaysia but decided it was not his cup of tea and left to venture out on his own. By luck he came across an opportunity to buy a tin mining company, owned by a British. The company was mining over 350ha of land in Bandar Sunway, Selangor. 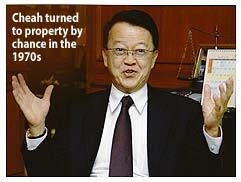 When the British decided to exit the business, Cheah made a quick decision to buy the land at RM100,000. In 1974, Cheah founded the Sunway Group of companies and later set up Sunway City (Suncity) Bhd to develop the 350ha land. According to Suncity managing director, property investment, Ngeow Voon Yean, Cheah had envisaged more than 15 years ago that the SIRC would be a vibrant city attracting generations ahead and a major tourism destination. Today, the SIRC is the only integrated resort city in Malaysia which fully encapsulates the "livability" concept with the presence of six key components - shopping mall, hotel, office, theme park, education institute and medical centre. The amazing rehabilitation and transformation of the landscape has won the township many international awards, including being adjudged the world's best leisure project by FIABCI (International Real Estate Federation, Paris) in 2002. BOAO (China): China's banks must report on the quality of their loan books by the end of June and take fresh steps to rein in risky lending to land developers, the chief banking regulator said yesterday. Liu Mingkang, head of the China Banking Regulatory Commission, said he had ordered banks in particular to check "project by project" loans extended to local governments' special investment vehicles, which borrowed 36.5 per cent of last year's record 9.6 trillion yuan in new lending. Loan officers must ensure that these investment vehicles are generating sufficient cash flow to service their debts and, if necessary, amend the loan covenants and demand more collateral. The CBRC will send inspection teams into banks next quarter to ensure any irregularities have been rectified, Liu told the Boao Forum on the southern island of Hainan. Some academics and investors have expressed concern that many of the loans made to local governments as part of the government's anti-crisis pump-priming package could turn sour. Liu said he had the backing of the State Council, China's cabinet, to set a very rigid timetable for banks to reassess their loans and rectify terms as necessary. "We have limited resources, but we must get focused on the most important areas. If we can do that, we will feel comfortable in the years to come," Liu said. He also warned banks to be selective in supporting real estate developers and said the CBRC had instructed banks to lower loan-to-value ratios when lending to companies acquiring land. Land prices more than doubled last year and some plots in Beijing have fetched record prices this year, snapped up by state-owned enterprises (SOEs) whose core business has nothing to do with real estate development. The government has since ordered 78 SOEs to divest such non-core businesses, and Liu said the principle that the highest bidder should win a land auction was not appropriate in China. The CBRC has ordered lenders to lend against the collateral of construction projects that are under way, not undeveloped land, and encouraged them to lend only to a limited list of developers with a good track records, Liu said. He said banks should not make loans to property speculators. If they have doubts about the motives of someone seeking a mortgage for a second or third home, they should charge more for the loan and demand a higher down payment. He noted that some banks in Beijing were now requiring buyers of second homes to make a down payment of more than 60 per cent of the value of the property. The minimum set by the CBRC is 40 per cent. First-time owner-occupiers taking out a mortgage need a down payment of only 20 per cent. Liu said he felt comfortable about the level of mortgage risk in China as underlying demand for housing remained strong. Moreover, most first-home buyers were paying a down payment of 30 per cent and second-home buyers were providing 40-50 per cent. Banks had made provisions equal to 166 per cent of their bad loans to the real estate sector, he said. "We have enough bullets to fight against possible downward risks in that market," Liu, who was speaking in English, said. Liu's remarks and actions are the latest stage in a campaign by the authorities to ensure that last year's credit splurge and fast-rising property prices do not sow a new crop of bad loans. To that end, the CBRC has pushed banks to raise fresh funds to bolster capital ratios depleted by last year's lending spree. The CBRC has also ordered banks to increase loan loss provisions. The property sector, a central pillar of the Chinese economy, is at the core of the CBRC's concerns. Beijing faces the balancing act of continuing to promote widespread home ownership while deterring speculative investment that has driven prices in major cities beyond the reach of ordinary Chinese, prompting widespread grumbling. KUALA LUMPUR: Malaysia’s real estate investment trust (REIT) market is expected to swing upwards closer to their net asset value (NAV) in the next six months, with the entry of new players that can attract foreign investors, said Hall Chadwick Asia Sdn Bhd chairman Kumar Tharmalingam. Besides YTL Corp Bhd’s Starhill REIT, he said the bigger ones that could cross the RM4bil threshold include Sunway REIT, which has a stable brand name including Sunway Resort and Monash University. “The moment an individual REIT achieves a value of RM4bil, it will attract foreign investments. “Foreigners may put in US$100,000 into the REIT, or maybe buy 5% or 10% of it,” he told reporters after speaking at The Edge Investment Forum on Real Estate 2010 on Saturday. He said with a bigger local REIT market, foreign investors may even opt to put a large sum in one of the larger REITs and spread the rest of the investments into smaller REITs. “Right now, with the exception of Axis REIT, most are trading at about 15%-18% below NAV, compared with property stocks, which are trading at 30% below NAV,” he said. Among those that are expected to trade closer to NAV are Quill Capita Trust, Axis REIT, Starhill REIT and UOA REIT as they have plans to attract foreign investors, he said. Tharmalingam said the NAV would also rise due to the revaluation of undervalued properties such as those under UOA REIT.